As my winter holiday came to a close, there was one more place I was scheduled to stop in. I was scheduled to stop over in Dubai in the United Arab Emirates in order to return home. It just so happened that I would be in Dubai for New Year's Eve. This was actually my second time in Dubai. The first time I came here was in 2014 for a conference. The first time I visited Dubai, I did not actually get to spend much time exploring since a good portion of my time was spent at the Hyatt Regency in Deira attending various seminars and talks. However, I did manage to skip out on one of the days to check out Dubai Mall and later meet with a friend who was living there at the time to see Dubai Marina at night. The fact that I ended up in Dubai for New Years Eve was a happy coincidence in addition to practicality. In order for me to get home, it would be easier for me to fly from the Maldives to Dubai, spend New Year's Eve there, and then catch my flight out on the morning of New Year's Day. There were other options I could have taken, but this option was actually the cheapest, and I was also aware of Dubai's reputation when it came to fireworks displays for New Year's. Anyone who has been to Dubai knows that it is not a cheap city at any time of the year. This was especially true during New Year's Eve when the city was expecting upwards of one million visitors for the celebrations. Prior to arriving, I was looking at hotels, and I started to become quite worried. All of the hotels I looked at were either sold out or rooms were going for $500 per night and up. I was certainly not keen on shelling out that type of money. As I continued my search, it became very clear to me where I would probably needed to stay. During my search, I had deliberately avoided one area in particular, but I knew that is where the more reasonably priced places would be. Eventually, after looking and having no luck, I realized that I had no choice. I was going to have look for a hotel in the area I had stayed in before in 2014. With that, I began looking for accommodations in the area known as Deira. From my experience, this is an older area of Dubai that is home to more reasonably priced hotels, but which tends to be lacking in quality, cleanliness, and comfort. If I have to be honest, if you're willing to stay in rather subpar accommodations yet save money, this is the area to stay. Of course, since it was New Year's Eve, pretty much all of the hotels in this area were booked as well. The only ones that were not often had negative reviews with 1 or .5 stars out of 5. I remember one review in particular for a hotel that said "I would never stay here again even if it were free." That sentiment seemed to be common with many of the hotels I found in this area, and it did not surprise me. Eventually, I did find a hotel that was ranked 2 stars and booked it knowing from past experience not to get my hopes up too much. If I have to be honest, this was a place I was not looking forward to staying in, but I had very little choice in the matter. Plus, it would only be for a couple nights, and I could live with that. I've stayed in worse places before and survived. In order to get to Dubai, I had to fly from the Maldives, have a stopover in Saudi Arabia, and then continue onto the United Arab Emirates. The flight to Saudi Arabia from the Maldives was on Saudia, which is the national carrier of Saudi Arabia. The plane was a Boeing 737, and I was surprised at how few passengers there were on the flight. The plane could have easily held over 300 people, yet only about 50 people were on the flight in total. This was nice since I had a row completely to myself. Having a row to myself has not happened to me in a surprisingly long time. Usually, I have a row to myself until the very end when the last passengers board, and they sit in the same row. I've flown on many different airlines during my travels and flying on Saudia was a relatively unique experience since I got to experience the quirks of flying on an airline that belongs to one of the most religiously conservative and strict countries in the world. Of course, before take off, part of the procedures was playing a prayer in Arabic for safe travels. The screen showed the prayer in Arabic along with English subtitles. This was not particularly unique to me. I last remember seeing a similar practice when I used Royal Brunei Airlines in 2012 before flying from Kota Kinabalu, Malaysia to Brunei. When I looked in the in-flight magazine, I noticed that in the entire magazine (100 pages or so), there were only two pictures of women and both were wearing headscarves. For me though, the extent of the extreme conservatism that saturates the Kingdom was while watching some of the movies and TV shows. The editing and censoring was so much that I actually stopped watching because I couldn't follow the story. Every word that could be seen as a vulgarity regardless of how minor was edited out, and all bare legs, bare shoulders, and cleavage on females was blacked out or pixelated. This became annoying when I was trying to watch an episode of "The Big Bang Theory." To me, they had blocked so much that it would be honestly better if they did not offer those movies or shows at all. Upon arrival in Riyadh, Saudi Arabia, I had a two hour layover. It was here that I got an idea. It is well-known that my goal is to visit every country in the world and to collect money from every country I visit. Since Saudi Arabia does not offer tourist visas (maybe this year), I figured this might be my only chance to get some Saudi Riyals. There were ATMs all over the airport, so I decided to take out a bit to try to add to my collection. It was while doing this that I learned a valuable lesson. I knew there would be a withdrawal fee, but it was nominal, so that did not bother me. However, I didn't pay attention to how much I took out, and I ended up withdrawing the equivalent of $500 worth of Saudi Riyals. This was way more than what I wanted. On the plus side, I got some nice examples of Saudi money of different denominations, but on the negative side, I could not do much with it. However, news sources have stated that Saudi Arabia is looking to offer tourist visas in a couple months in a bid to wean itself away from oil, so maybe these Saudi Riyals will come in useful later. Even though I don't agree at all with the extreme views of the highly-conservative ruling class of Saudia Arabia, I am certainly willing to visit and see the country. Eventually, I made it to Dubai, and upon exiting the airport terminal, the first taxi driver did not know where the hotel was located. Luckily, the second one kind of did. He dropped me off in front of its restaurant. I then walked behind it to the actual entrance. As expected, the hotel was less than stellar. The light switches did not work, so the bellhop had to turn on the lights using the fuse box in the room. My first thought when I walked in the room and saw it was "It could be worse." Aside from the fact that the ceiling had water stains, walls were dirty with scuff marks, the closet was missing a handle, the room safe was permanently locked because a previous occupant never reset it, only one towel was in the bathroom, and furniture that was way too large for the size of the room, I've been in worse places. The only difference was that this place seemed to have migrants actually living in some of the rooms. When I left the room, some guys had their doors open, and I could hear TVs blasting and see clothes hanging from clothes lines inside. It honestly looked like they were using some of the rooms as apartments. I knew what I was getting myself into when I booked this place. I expected it to be a trashy type of hotel, and it certainly was. However, I only had to stay here for a couple nights. Thankfully, when I arrived, it was already late, so I went to bed and fell asleep pretty easily. The next morning, I learned that the hot water did not work, so I had to shower in freezing cold water. It was not a fun experience, but it definitely woke me up. While the hotel itself was terrible, it was very close to the famed Dubai Gold Souk, and it was not a far walk to the metro station. Since it was New Year's Eve, I figured I might as well explore more of Dubai. That would mean I would be out of the hotel for as long as possible. Prior to leaving for the day, I tried to figure out where to spend New Year's Eve. Dubai is famous for its massive fireworks displays, and I definitely wanted to witness it. As I did my research, the biggest issue was what time to get there. Of all the places I looked at, most of them suggested arriving hours earlier before midnight such as 6 and 7pm. The idea of getting to a place 6 hours before midnight did not appeal to me, so I kept on searching until I found an option. The option I found was to spend New Years Eve watching the fireworks from Al Sufouh Beach, which was nestled between the Burj Al Arab and the Palm Jumeirah. It seemed ideal, but I wanted to make sure I knew how to get there. The last thing I wanted to do was head out an hour or two before midnight and find I couldn't figure out the way. Since it was the morning, and I had nothing else to do, I figured I had a lot of time to a practice run. Taxis are not cheap in Dubai, so I opted to do all of my traveling via the metro. Getting a metro day pass was easy enough. There are only two metro lines in Dubai, so it was not really possible to get lost. It kind of reminded me of the Daegu Metro System when I was in South Korea. At the time I lived there, there were only two lines and one main transfer station in the center of the city. Prior to heading to the beach to make sure I knew the route, I wanted to visit two shopping malls. No trip to Dubai is complete without a visit to the famed Dubai Mall and Mall of the Emirates. Both of these places are enormous, and one can easily spend hours just walking around without doing any shopping. Since I had previously visited Dubai Mall when I last visited, I decided to hit Mall of the Emirates first to check it out. For me personally, I felt as if Dubai Mall was the better of the two malls even though they seemed to have more or less the same stores. In fact, in both of them, one can find pretty much every luxury brand you can think of, such as Rolex, Tissot, Cartier, and Tiffany's among many others. I do not even think the most affluent malls in the US can boast of that. Even though Mall of the Emirates was nice, and I got to see the indoor ski slope, I actually really wanted to visit Dubai Mall again. The first time I visited, I was completely overwhelmed by the size of it, and I did not actually do much while I was there. Most of my time that first time was spent wandering around and finding that the mall just seemingly kept going and going. This time though, I had a mission. I wanted to first visit the Dubai Mall Aquarium, and then I wanted to get a ticket up to the top of the Burj Khalifa, which is the tallest building in the world. Unfortunately, I would only be able to do one of those. The tickets for the Burj Khalifa were sold out for the day and hour I wanted. I will have to return to Dubai for that experience at a later time. However, getting tickets for the Aquarium was no problem. I was quite impressed with the Dubai Mall Aquarium. It was much better than what I expected. There was a lot to see, and I was impressed at the amount of sea life that are on display there. Of course, in the large tank that everyone stands in front of and takes pictures of, they have all manner of fish including sand tiger sharks, saw sharks, and various rays. There are also many smaller tanks with other kinds of fish, turtles, sturgeons, and various kinds of crabs. In addition, there also some interesting jellyfish displays that make the jellies red and green since they are almost completely transparent without the lights. After I finished walking around Dubai Mall, I wanted to make sure I knew the way to Al Sufouh Beach, so I took the train to the Marina and then saw I would need to take a tram. That seemed easy enough, so I decided not to head all the way to the beach. By this time, it was the early afternoon, and I had been out since the morning. Even though I wanted to walk around the Marina more, I knew that I would need my rest in order to be rested for New Year's Eve. Now that I knew the way, I stopped off at a Subway for a late lunch then headed back to the hotel for some rest before heading out for the evening festivities. Before actually going to the hotel though, I decided to stop off and check out the Gold Souk since the hotel is literally a stone's throw away. 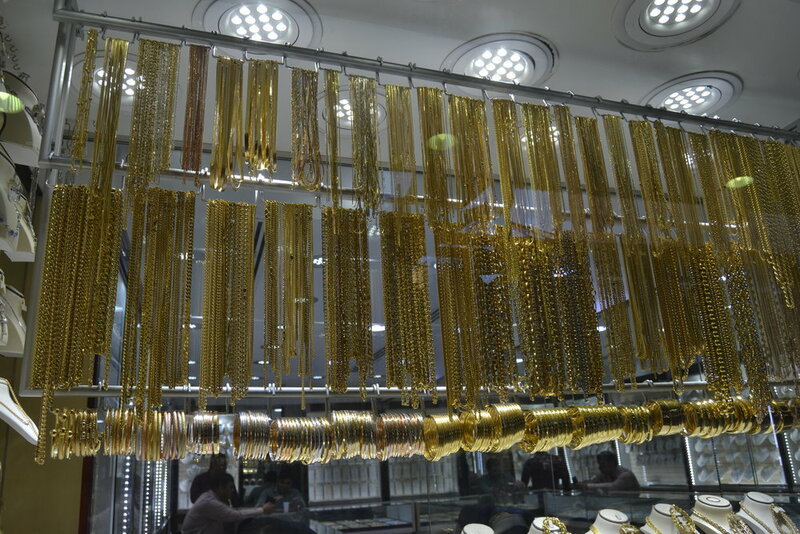 The Gold Souk is a place where someone can go to buy all kinds of high-end jewelry in the form of rings, necklaces, pendants, and all manner of other fashion accoutrement. 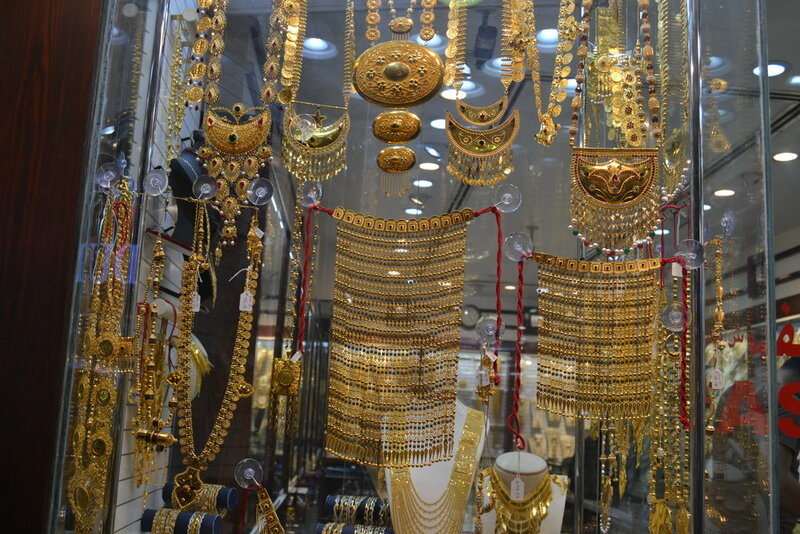 The government closely regulates the sale of gold and the merchants in this area, so it is unlikely to be sold something fake lest the merchants lose their license and reputations. Of course, while the government regulates the shop, I still occasionally had guys on the street coming up to me and showing their watches they claimed were Rolex or Bulgari. Some things never change no matter where you go. At about 8pm, I left the hotel and made the journey to Al Sufouh Beach. The journey was easy enough, but once again the trains were absolutely packed and even uncomfortable to a point. Upon disembarking at the Al Sufouh stop, it was an easy 10 to 15 minute walk to the beach. While a vast majority of the visitors and residents of Dubai went to one of the many other well-known locations for fireworks displays, the beach was something of a local getaway. When I got there, a lot of locals had set up grills, shisha, blankets, and were just taking it easy until midnight. A lot of them even brought RVs and trailers. The location actually turned out to be quite good. From my location, I was able to see the Burj Al Arab to the east, the Palms at Jumeirah and Dubai Marina to the west. Essentially, I would be able to get a view of three fireworks shows from one vantage point. The only downside was that I was a relatively far distance from all of them, so the fireworks would not be as large, but I would get to see three fireworks shows. By the time I got there, there were still 3 hours until midnight, and although it was not terribly crowded at that time, more people were arriving, and the temperature was dropping, but it was not freezing. It was while waiting on the beach that I had wished I had brought my jacket. It was not terribly cold, but it was enough to want to have worn at least a long sleeve shirt or a light jacket. I did not pack any long sleeves for this trip, and I had decided to leave the light jacket in the hotel room since I thought I would not need it. I was wrong. There were times I thought of going back to get it, but I didn't want to take the chance of the transportation being slammed and slowed down. The last thing I wanted to do was spend New Year's Eve on a crowded train, especially since I was already in the spot I had previously planned on, so I sucked it up and dealt with the cold. In order to keep warm, I walked up and down the half mile strip of beach several times. Keeping warm was one issue. There was also one other problem. This is a rather secluded beach, and facilities are lacking here. Therefore, there were no public bathrooms anywhere nearby. After about an hour or so, I really needed to use a washroom, but once again...I could not risk leaving to find one and coming back after midnight, so I decided to hold it. This meant more walking up and down the beach. At about 11pm, I was getting a bit uncomfortable. I was not only cold, but I also had to use the bathroom. I initially thought of trying to find a secluded spot on the beach, but by this time, a lot more people had arrived, and very few places were now private. In order to try to kill time, I went over to the western edge of the beach, put my backpack down on the sand, used it for a pillow, and laid down. Strangely enough, despite being kind of cold, I actually fell asleep on the beach until 11:45pm. At 11:45pm, I got up and claimed a spot on the rocks near a dock. When the countdown began, I could see the lights of hundreds of phones recording the event on the beach. There was no official countdown, but close to midnight, the lights of the Burj Al Arab began to flash while the Burj Khalifa began shooting off lasers from the top. To the west, the fireworks at the Palm Jumeirah and Marina began. Luckily for me, I just had to turn to see three different fireworks displays at once. The fireworks lasted for about 10 minutes, and in retrospect, this was a pretty good spot. The only downside though was that while you get three shows, you are relatively far away, so the fireworks are a bit smaller than you might expect, but I am sure that if you were closer, it would be better. Regardless though, I was extremely grateful to get to spend New Year's Eve in a place that is regularly lauded for its massive and impressive fireworks. In my case, I got to see three shows simultaneously from a relatively isolated location with mainly locals and expats who live in Dubai. After the fireworks ended, everyone began leaving the beach, and I followed suit. As expected, the trains were quite packed, and even though I left the beach at 12:30am, I finally got back to my hotel room at 2:30am where I promptly fell asleep. Overall, my Christmas holiday to Singapore and the Maldives along with New Years Eve spent in Dubai was a success. There were no major hiccups, and I was able to see a lot of what was on my list. In terms of my country count, I was able to hit two more new countries which brings me up to 73 countries. If I had to be honest, it was actually really nice to have gotten the chance to travel back to Asia. It had been awhile since I was last there, and it has definitely made me want to return at my next available opportunity.